Rheumatoid arthritis is an autoimmune disorder that occurs when one’s system attacks its own tissue. When this attack occurs, fluid builds up in the affected joints, causing pain in the joints and inflammation that is gradual. This condition can affect anybody but it seems to affect a larger percentage of women above the age 40. Normally, the infected person firstly feels pain at the smallest joint in the body after which symptoms like fatigue and weight loss follow. In 80% of people´s blood suffering with rheumatoid arthritis there is an antibody called “rheumatoid factor”. A blood test will prove the presence of the antibody. Examining the joint and studying the ultrasound images can also show its presence. What the blood test does is to look for antibodies that are found in RA and to check for high level of inflammation. In normal conditions, the symptoms have to be in place for about 3 months to consider it a reliable diagnosis. Depending on the way the body reacts, the disease may grow continuously and progressively becoming worse over time in some individuals while others enjoy a longer period of stability with no disease activity or symptoms. 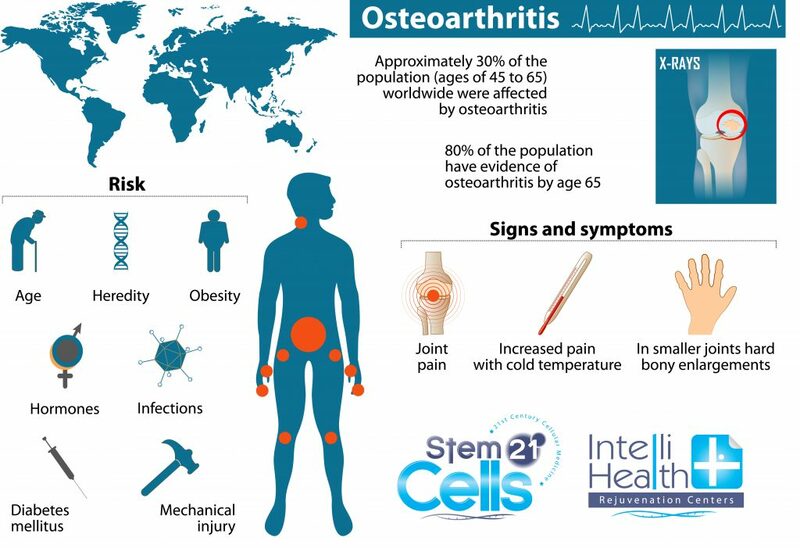 StemCells21 medical team apply stem cells for rheumatoid arthritis treatment in order to yield a positive result and improve conditions and symptoms for the patient. Stem cells have regenerative, immune-modulatory and anti-inflammatory properties and are used to treat several medical diseases and autoimmune disorders, such as rheumatoid arthritis. Stem cells have the ability to transform and fit in to meet the needs of the environment they are introduced to. Example, when placed near damaged cartilage, stem cells can transform into cartilage tissue. Rheumatoid arthritis is described as a chronic inflammatory-disorder which benefits from the anti-inflammatory properties of stem cells. How are stem cells administered to the patient? There are two known ways to administer stem cell into the body; one is done via a surgical procedure while the other is delivered through injections directly into the damaged arthritis joint. Depending on the procedure, it may be advisable to use medical imaging such as ultrasound because the injection needs to be delivered directly into the damaged joint. Mesenchymal stem cells are the most common type used for rheumatoid arthritis treatment, and they are found in adipose tissue (fat), bone marrow and the peripheral blood stem. The process of collecting them from these sources is called “harvesting”. 1 – Bone marrow: From the patient’s bone. A needle and syringe are used and the patient is given a sedative before harvesting the stem cells. 2 – Adipose Tissue (fat): Surgical operation. 3 – Peripheral blood: Taking blood sample. Of these four types of stem cells, the type used to treat rheumatoid arthritis is adult stem cells. Each patient is unique and reacts differently to treatment, so the healing process varies for each case. Most patients take approximately 2-3 months to notice results while some may see results around 5-6 months after the procedure. How safe is rheumatoid arthritis treatment with stem cells? Stem cell therapy to a large extent is considered safe because the stem cells used are harvested from the patient, and this minimizes completely the risk of rejection. Swelling and minor pain are the most common side effect experienced by patients right after treatment. Our body uses stem cells to repair and replace worn out tissue on a daily basis. When the body fails to reproduce stem cells, the regenerative power (ability for the body to heal itself) and we are prone to disease and injury. Some side effects after stem cell treatment may include fever, headache, and nausea. These side effects don’t last any longer than 24 hours and are experienced mostly by people sensitive to the mild anesthesia administered before the start of the procedure. No long-term negative side effects have been reported. Early diagnosis and prompt treatment of rheumatoid arthritis with stem cells can avoid joint destruction, organ damage and potential disability. Would you like Treatment for Rheumatoid Arthritis?